Let us suppose that profitability is your top priority. Then you should know that the 1050H is built with the objective of low cost and high performance under severe conditions. High engine power and above all high torque at working speed supply large hydraulic force even when processing difficult trees. The 1050H features fully 220 HP and 949 Nm already at low 1400 r.p.m.. The flow rate allows for quite high feed rates at a low relaxing engine speed. We also know that service is important to be able to work without facing problems. Thus we dispose of a well established service network. The design as such is service-friendly too. Further ergonomics are an important factor. 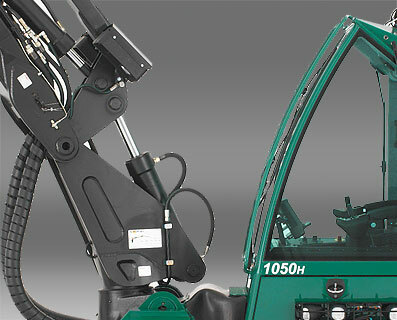 The ergonomics of the 1050H allow for high working performance even at the end of a long working day. These factors altogether result in a reliable machine with higher profitability. 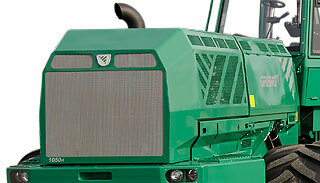 The 1050H is equipped with 4 cooling devices. The radiator for the engine and the cooling device for the air condition plant are situated in the traditional place in front of the engine. Situated at the opposite end facing the cab are the coolers for the working hydraulics and the hydrostatic both aerated by a thermostat-controlled hydraulically driven fan. Owing to this unique solution and the well aerated engine room you can work comfortably even on a hot summer day. The gross lifting moment is 138 kNm enabling you to cope even with really big trees. By means of the IQAN Experience it is easy to adjust the operating mode of the boom to your personal preference. IQAN Experience permits individual settings for 5 different operators. The 1050H is equipped with 8 wheels arranged for optimum weight distribution in the harvester´s natural home, out in the forest. Automatically operated articulated waist lock and bogie locks on all bogies. Bogielift with separate controls for left and righthand side. 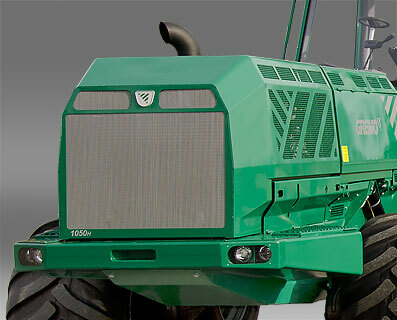 As standard the harvester is supplied with tyres '600/50x22.5'. 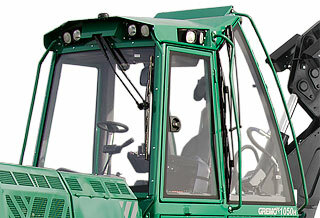 The driver´s cab is well positioned and has downward extended panes offering excellent visibility. You can see the wheels without having to lean out. The selection of trees does not require much effort, and the narrow posts permit perfect visibility during the processing. 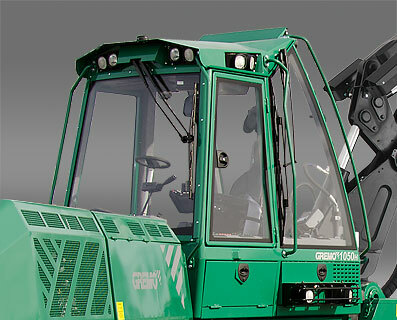 Side lights low positioned on the cab enable you to lighten up the lateral surroundings of the machine. Two different harvester heads can be attached to the boom. 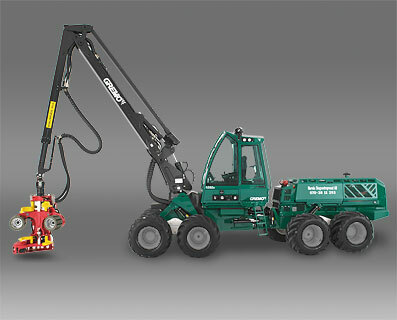 As standard the allround aggregate SP 561 LF. Cuts up to 60 cm felling dia. and is best suited for rough thinning and final cutting up to dbh 43 cm point to point delimbing dia. The optional thinning aggregate SP 451 LF cuts up to 53 cm felling dia. and is best suited for varying thinning up to dbh 35 cm point to point delimbing dia. The Gremo 1050H features the same excellent weight distribution and low point of gravity as the previous machine. This means outstanding stability in all directions and allows for high-performance processing even in really tough terrain. On sharp slopes down-hill work is feasible as long as the machine has grip. Climbing up-hill, of course, is easier with an 8-wheel equipped machine than one equipped with 4 or 6 wheels only. The Gremo 1050H owing to its 8 wheels and the excellent weight distribution is very gentle to the ground. It is outstanding on wet ground, as caterpillar chains can be put on both front and rear wheels. 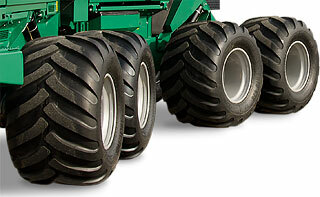 As standard the 1050H is supplied with 600/50x22.5 tyres. 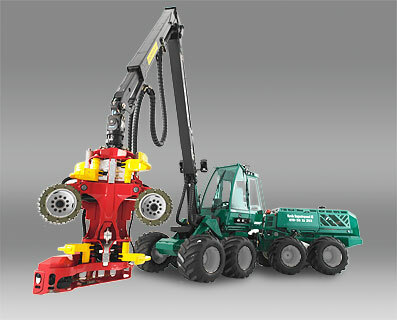 As an option the machine can be equipped with 650/45x22.5 or 710/40x22.5 tyres. 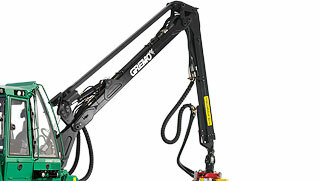 The Gremo 1050H is normally furnished with the universal type harvester head SP 561 LF. This cuts up to 60 cm felling dia. and delimbs 43 cm point to point. It is suitable for rough thinning and final cutting work. 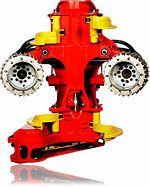 The optional SP 451 harvester head is suitable for all types of thinning and manages also relatively big trees. It cuts 53 cm felling dia.and delimbs 35cm. Both harvester heads are equipped withLogHold, a patented system for holding the tree and with QuickCut for minimizing cutting cracks. The unique stability is increased by the fact that all bogies during the processing are locked by the bogie-lift cylinders (standard). You can also select bogie-lift separately for the front wheels or the rear wheels. Or all-around! 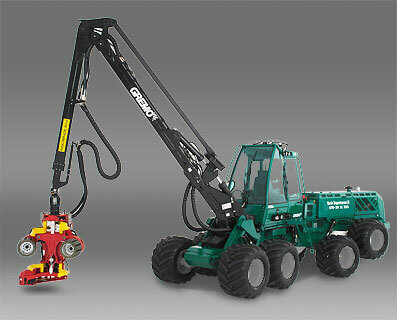 This offers great versatility in tough terrain and increased flexibility compared to that supplied by smaller machines. The large downward extended window panes, the high upward extended side and rear window panes and the narrow poles offer excellent visibility across the whole working area. You can easily select the trees for processing, and you can see the wheels without having to lean out. And you have a good view of the ground in front of the machine. The strong and fast working parallel type boom is situated adjacent to the cab to enable you to follow the harvester head´s way through the trees. You are able to drive faster and avoid damage on the trunks. 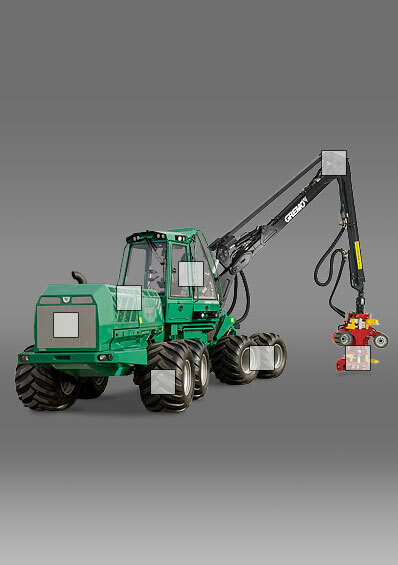 Loglift 181 boom with 10 metres reach is standard, 11.1 m reach is optional. The 1050H is unusally well prepared for work on hot days. The engine room is well aerated.The radiator and the cooler for the AC plant are arranged in the traditional place. At the other end, facing the cab, are situated the large cooler for the working hydraulics and the cooler for the hydrostatics. These two are cooled by a separate thermostate controlled hydraulically driven fan.